Suitcases have multiple personalities, in my opinion. When the Hubs travels his suitcases get yanked from under the spare bed and thrown on said bed ready to be stuffed with his needs for the week. Occasionally, he'll ask for my help in packing since I am the queen of "Jenga-ing" But overall, I hate to see the suitcase out because that means he's going somewhere. But his suitcase represents what is to come for him on the trip. Did he pack a suit? Or was this strictly a khaki/polo trip? Don't get me wrong...I love to travel, and at those times, suitcases have lovely personalities. Blooming like the trip itself...full of possibilities. Do we pack more shoes or do I need the sundress for the nice dinner we'll have one night? Do I need the sneakers for hikes or a workout? To bring the swimsuit or not bring the swimsuit? 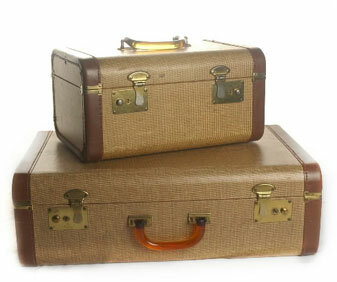 Is this trip's suitcase a glitzy, girl's weekend? Or is it a simple weekend at the parents house? I'm always amazed by the various personalities that match your suitcase. In an effort to find your own case off the luggage carousel at the airport, many folks now tie string, ribbon or various noticeable items to be able to snag your bag. Did you ever stop to look at the color ribbon or item that your fellow baggage hunter has used? The hot pink, polka dot ribbon for the businessman next to you? Or the frog prince luggage tag the size of a small dinner plate - that goes to the 90-year old woman with the bad Christmas sweater next to you. And so on...so what identifies your bag? Because it may or may not be a good representation of you and where you've been, not to mention where you're going! Bon voyage!